With some of these voice lines, I keep expecting to hear Saltzpyre say, "I drink this from need"
E3 2018 may be in the books, but there are still a few news stories floating around there. 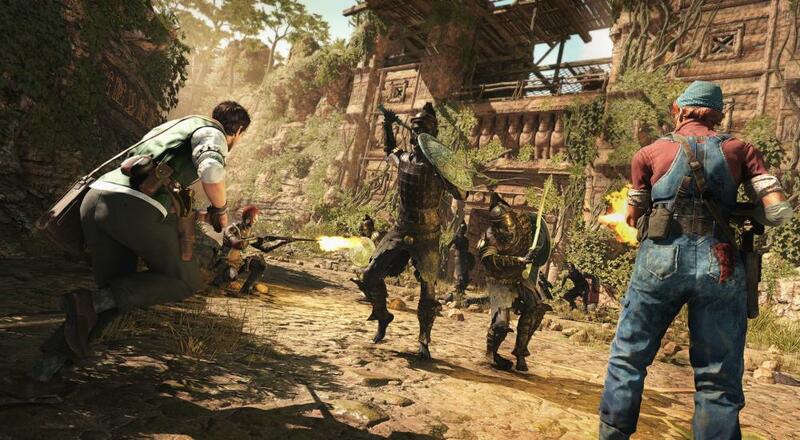 Rebellion posted a narrated walkthrough of some gameplay from their forthcoming co-op adventure, Strange Brigade, last week, and the more we see, the more we like. Traps, puzzles, and more await you and your buddies. While the shooting of undead hordes and other beasties isn't anything too new, there are a few interesting tidbits shown off in the video below. For starters, the gold and loot you collect during a level can be spent later to unlock new weapons to use. Additionally, different weapons will have different slots that can be used to power-up your arsenal so your chosen weapon does more damage or shoots ice bullets. There are also relics you can acquire behind special, hidden puzzle doors you'll have to work together to solve. These relics grant you and your buddies access to new special powers via the mystical amulet. Gotta say, looking forward to this game more and more! Strange Brigade is out on August 28, 2018 on Xbox One, PC, and PlayStation 4. Four player online co-op is supported throughout the campaign.